Only 2 miles (3.2 km) from Merthyr Tydfil's town centre and a few hundred metres from Pentre-bach railway station, the hotel offers comfortable, great-value rooms and free parking. 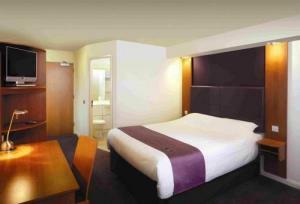 Just off the junction of the A4060 and the A4054, the Premier Inn Merthyr Tydfil has a convenient location, with good access to the region's major roads. The hotel has a 24-hour reception desk and some rooms can take 2 adults and up to 2 children (under 16 years). The 2 children also get a free full breakfast when accompanied by an adult eating a full breakfast. An all-you-can-eat buffet breakfast is available each morning and includes the expected cooked items such as scrambled, fried, poached or boiled eggs, and pork or vegetarian sausages. There is also a wide continental selection. The on-site Table Table restaurant offers a fresh new twist on eating out.